The US dollar is trading mixed against some of its major currency rivals on Thursday as an influx of data is weighing on the greenback. With uncertainty surrounding the Federal Reserve, the market is unclear how to trade the buck in the short- to medium-term. But investors are snapping up billions in long-term bonds, signaling a bullish sentiment in the US economy. According to the Bureau of Labor Statistics, the number of Americans filing for jobless benefits to 196,000 in the week ending April 6, which represents the lowest reading since October 1969. It also beats the market forecast of 211,000. The biggest drops were situated in California, Missouri, and Idaho, while the largest increases were found in Michigan, Tennessee, Washington, and Indiana. In March, US producer prices recorded their biggest increase in five months, the Department of Labor reported. Last month, the producer price index (PPI) for final demand edged up 0.6%, buoyed by the rising cost of gasoline. It follows a 0.1% gain in February, beats median estimates of 0.3%, and accounts for the largest jump since October. The 12-month PPI advanced 2.2% after increasing 1.9% in February. Meanwhile, the Federal Reserve continues to shift in its stance on monetary policy. After months of confirming that it only intends to raise interest rates once this year and potentially zero in 2020, the US central bank noted that it is willing to keep the door open on a rate hike should the economy improve, according to the latest Federal Open Market Committee (FOMC) minutes. Several participants noted that their views of the appropriate range for the federal funds rate could shift in either direction based on incoming data and other developments. Some participants indicated that if the economy evolved as they currently expected, with economic growth above its longer-run trend rate, they would likely judge it appropriate to raise the target range for the federal funds rate modestly later this year. According to the CME Group FedWatch tool, the market is not penciling a rate hike at all, and a growing segment of the financial community expects the Eccles Building to cut rates. 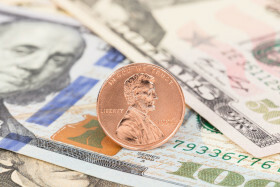 This would please the White House as it has repeatedly urged the Fed to slash rates, including chief White House economic adviser Larry Kudlow who thinks a half-point rate cut would suffice. On Wednesday, Treasury Secretary Steven Mnuchin revealed that China and the US have “pretty much agreed” to an enforcement aspect of their historic trade deal. This had been one of the more contentious issues of trade negotiations so far, which suggests that a new US-China trade agreement might be on the horizon after months of back-and-forth talks. Some of these developments have traders bullish on the bond market. Treasury data found that investors bought $17 billion worth of 30-year bonds. The USD/CAD currency pair rose 0.44% to 1.3379, from an opening of 1.3319, at 20:50 GMT on Thursday. The EUR/USD tumbled 0.17% to 1.1257, from an opening of 1.1277.